All too often we get bogged down with everyday chores and worries and forget that "life is meant to be fun". It is important to take time to enjoy life ie find time for recreation, fun and laughter. There are lots of things we can do for recreation. We are limited only by our imagination and we all have our own particular thing that we enjoy doing. Take time out to spend with family and friends, go on a picnic, spend a day at the beach, watch your favourite sport – you all know what you like to do. Just make sure you do something that you enjoy and that relaxes you. I spend so much of my time at the computer these days, that I love to get out into the garden – I find it relaxing, and also, it gives me some much needed exercise. "I live by this credo: Have a little laugh at life and look around you for happiness instead of sadness. Laughter has always brought me out of unhappy situations. Even in your darkest moment, you usually can find something to laugh about if you try hard enough." So, don't forget to laugh often. It is very beneficial to your health. 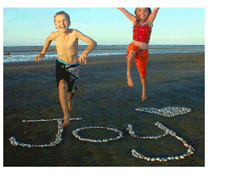 It's a fact that fun, joy and laughter can create good health and wellbeing. If what you are doing is not bringing you joy, find something else that will. We think better, perform better, feel better and are healthier when we are happy. Even our physical sense organs work better. In answer to the question: "Is it true that laughing is good for your health? ", Robert McGrath, a clinical psychologist specializing in mind/body wellness at University Health Services at UW-Madison stated "Humor results in a general decrease in stress hormones. Vigorous laughter temporarily increases the heart rate, benefits the immune system, increases alertness, and exercises skeletal muscles. Levels of epinephrine and dopamine decrease as a response to humor and laughing," he says. The physical effects actually resemble those of a good workout, McGrath adds. "There is an increase of endorphin levels, the body’s natural painkiller." Laughter, indeed, is the best medicine. "And if you are not ready to start your day with a full dose of this great medicine, just smile," he adds. To stay healthy and happy, McGrath prescribes 30 minutes of exercise, 15 minutes of humor, and 15 minutes of smiling meditation. Watch a funny movie, read a funny book – whatever it is that 'tickles your fancy', gets you laughing and keeps you happy. Remember the old saying "Laughter is the best medicine" - It seems that is true. Laughter activates the chemistry of the will to live and increases our capacity to fight disease. Laughing relaxes the body and reduces problems associated with high blood pressure, strokes, arthritis, and ulcers. Some research suggests that laughter may also reduce the risk of heart disease. Laughter, along with an active sense of humour, may help protect you against a heart attack, according to a recent study by cardiologists at the University of Maryland Medical Center in Baltimore. The study is the first to indicate that laughter may help prevent heart disease, and suggests that a good sense of humour and the ability to laugh at stressful situations helps mitigate the damaging physical effects of distressing emotions. Laughing at ourselves and our situation helps show us that small things are not the earth-shattering events they sometimes seem to be. Try looking at a problem from a different perspective and it may not seem to be quite the problem we first thought. The good feelings that are generated when we laugh can remain with us long after the laughter subsides. Laughter lowers blood pressure People who laugh heartily on a regular basis have lower standing blood pressure than the average person. When people have a good laugh, initially the blood pressure increases, but then it decreases to levels below normal. Breathing then becomes deeper which sends oxygen enriched blood and nutrients throughout the body. Humour changes our biochemical state. Laughter decreases stress hormones and increases infection fighting antibodies. It increases our attentiveness, heart rate, and pulse. Laughter protects the heart. Laughter, along with an active sense of humour, may help protect you against a heart attack, according to the study at the University of Maryland Medical Center (cited above). The study, which is the first to indicate that laughter may help prevent heart disease, found that people with heart disease were 40 percent less likely to laugh in a variety of situations compared to people of the same age without heart disease. Laughter gives our bodies a good workout. Laughter can be a great workout for your diaphragm, abdominal, respiratory, facial, leg, and back muscles. It massages abdominal organs, tones intestinal functioning, and strengthens the muscles that hold the abdominal organs in place. Not only does laughter give your mid-section a workout, it can benefit digestion and absorption functioning as well. It is estimated that hearty laughter can burn calories equivalent to several minutes on the rowing machine or the exercise bike. Humour improves brain function and relieves stress. Laughter stimulates both sides of the brain to enhance learning. It eases muscle tension and psychological stress, which keeps the brain alert and allows people to retain more information. "Laughter is an important key to health. Laughter can alter your internal chemistry from negative to positive, releases tension, shifts your perception so you can center yourself and makes life more enjoyable. Consider watching a good comedy instead of the news before bedtime and notice how much better you sleep." Clicking recreation will take you back to the Site Directory. Do you have a funny story that you'd like to share? ...or would you like to add a little laughter to your life? ...Just click this link.